It’s the weekend. You’ve worked hard. You want to treat yourself. But you also want to seize the day, go for a long walk (/shop) and make the most of your weekend. Too often, an indulgent breakfast means a sugar rush and food coma before 12 o’clock. The answer? 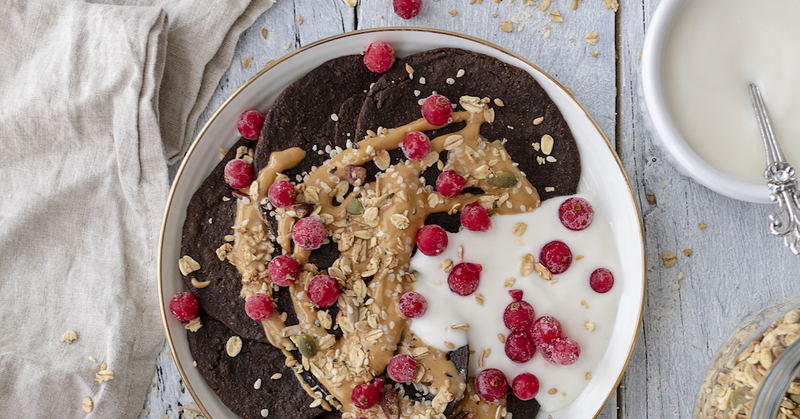 These chocolate hemp pancakes by Vegan food blogger Romy London. Delicious enough to start your day right, but packed with protein powder for a slow release of energy and gluten-free buckwheat flour to avoid a midday slump. Top with coconut yoghurt, berries, and a nut butter and sprinkle on some hemp seeds for good measure. Pour the hemp milk into a jug, then add the apple cider vinegar & and juice of half a lemon. Briefly stir, then set the jug into the fridge for at least 10 minutes. During this time the milk will begin to curdle, which is just what we’re after. It’ll help fluff the pancakes as it resembles buttermilk – something that can be very helpful when there’s no gluten, eggs or baking powder present in a recipe! In a mixing bowl combine the hemp protein, buckwheat flour, cacao powder and cinnamon. Once combined, create a well in the middle of the mixture and gradually pour in the hemp milk mixture, stirring in a few tablespoons at a time. The batter you end up with should be light, but not thin. If you find that your mixture is too thick & sticky, simply add a little extra hemp milk. Heat a large pan on the stove to a medium heat and lightly grease with coconut oil. Use a tablespoon to carefully pour the mixture into the pan, roughly 2-3 tablespoons per pancake but depends on how big you want them. If these look slightly thick, use the back of the spoon to even out the mixture. Once the pancake batter starts to look firm on the top, it’s time to flip! The pancakes should roughly need 3-4 minutes on each side over medium heat, but it also depends on the thickness you spread them out to. It’s best to check for the firmness of the pancake instead of going with a fixed cooking time. Repeat until all pancake batter is used up. Assemble your pancakes on a plate (or simply stack them! ), and add some nut butter, coconut yogurt, berries and a sprinkle of hemp seeds.